The brilliant success of the NZ Cricket team in the ICC World Cup has had the predictable response on the country’s kids and it’s great to see. Yes it’s true they are sitting about and watching the NZ games when they are on, but this inactivity is more than countered by the subsequent physicality as the games are replayed around the school. Dropping the kids off in the morning they are straight onto the cricket pitch, and picking them up in the afternoon you have to beware of bats and balls flying everywhere as you walk between classrooms. I haven’t asked but I am sure there must have been a broken window or two, and a few anxious teachers, as a consequence at school. I recall as a kid (yes I can remember!) being out on the street playing whatever sport happened to be on TV that week – back then pretending to be Brian Turner, Praven Jeram or Billy de Graf, Lance Cairns, Richard Hadlee or Ian Smith, Andy Haden, Brain McKechnie or Bryan Williams – a history lesson right there, you will be showing your age if you remember that lot. (Unofficial competition, without referring to the internet or any books, name their sport and respective positions). These games, sometimes involving up to 10 kids, only broken by Mums (or Dads) calling in each child respectively for dinner; or if bad light stopped play when a street light happened to blow. This informal, semi-competitive and social form of sport is great for kids (and adults) alike. It provides a way to form friendships, provides an opportunity for banter, and is an important and enjoyable form of exercise. The whole point is that anyone can have a go regardless of ability and it brings Te Whānau me ngā Hoa (friends and family) together. It is crucial that exercise is fun, functional and serves a purpose. It needn’t be seen as a chore, and not restricted to the gym. There are some people who love that form of exercise, others who like to walk, ride a bike, play tennis, or garden. It really doesn’t matter; find your niche, what you enjoy, the exercise is actually secondary – it is not the primary reason. Forget what you have read about 30 minutes a day, three times a week – all this does is foster guilt. Find something, do it as often as you want to, and enjoy the journey. 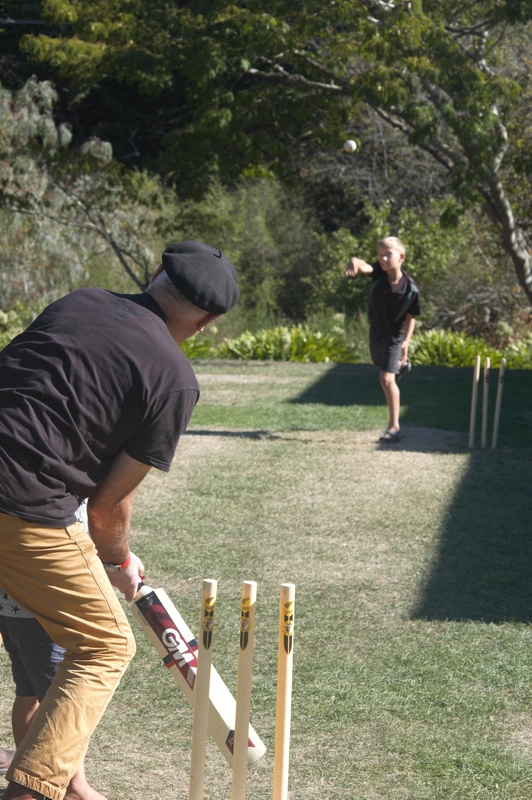 At home in the garden the cricket continues, Grandad is currently not out on 24 (off 34 balls) and Dan is bowling…………. And as for the windows – there has certainly been a few broken at home!